This pan-fried chicken breast recipe is simple enough to make for a busy weeknight meal. 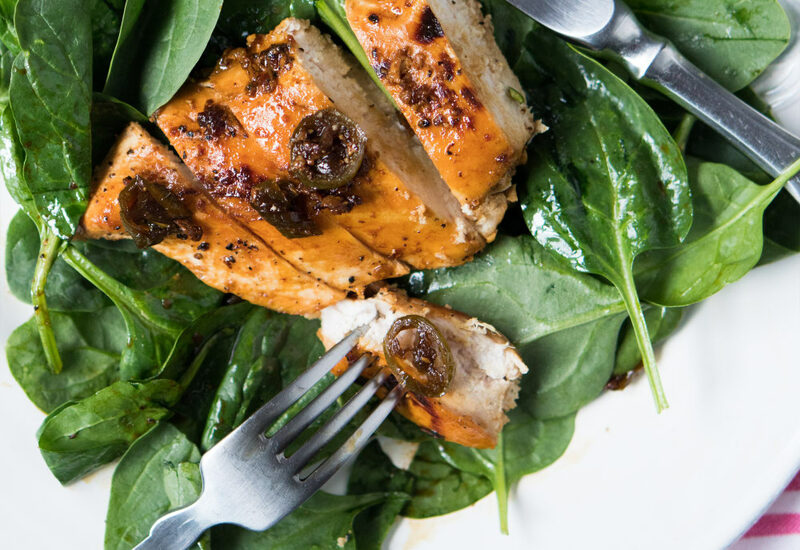 Start by marinating chicken breasts in garlic, pickled jalapenos, and olive oil. You get double duty out of that jar of pickled jalapenos, because you not only utilize the jalapenos, but also the flavorful brine! Then, simply season the chicken and pan sear. As a final flourish, add a touch of honey to the pan to create an incredible sweet and spicy flavor combination. Double the amounts and use the leftovers to make a delicious chicken salad for lunch. It's a great trick to cook once and eat twice! Per Serving: 365 calories; 15g fat; 20.4g carbohydrates; 38g protein; 102mg cholesterol; 1987mg sodium. YUMMMMM! I love just eating this by itself without anything else added to it. But I love just having protein. The picked jalapenos are perfect with the chicken. Love the sweet flavor that come through from the honey against the tart-spiciness from the jalapenos. This is delicious 😋 The honey and water creates a yummy glaze. There is just a hint of spice so it's not too spicy. Recipe is good. All you really need to do is salt and pepper the chicken to make it perfect. I wasn't so sure about pickled jalapenos but loved the combo with the sweetness of the honey. It wasn't too sweet or too spicy. This was such an easy dish to make, yet it's full of flavor. I'm more of a grill everything type person, but this has me rethinking. I definitely recommend marinating overnight. It made a huge difference for us in the texture and flavor of the chicken. The meat was tender, not dry like chicken breasts have a tendency to get. I love pickled jalapeños, so this recipe was a no brainer for me. I added cilantro and some balsamic vinegar to the marinade for extra flavor. I also used minced jalapeño instead of pickled. This chicken is perfect pan seared or also shredded. I've tried it both ways. I especially love to make chicken tostadas with it, delicious!